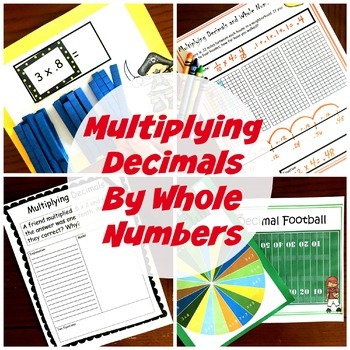 There are eight activities to help children learn how to multiply decimals. 1. Comparing Game Using Base Ten Blocks - Children solve a multiplication problem (5 x .2) and model it with base ten blocks. The person with the highest answer, gets to keep all the base ten blocks on the mats. The person with the greatest amount of base ten blocks after 10 rounds, wins. 2. Football game - children solve multiplication problems (3 x .9) to move up and down a paper football field. 3. 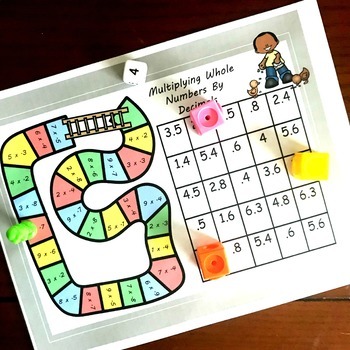 Coloring Pages - 2 pages where children solve the multiplication problem (3 x 9) or (.6 x 3) and then color in the correct answer. 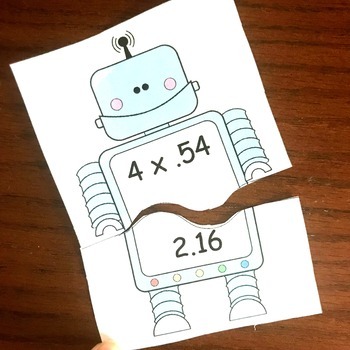 The numbers are the same, but the decimal is in different places (.23 or 2.3 or 23). The focus here is putting the decimal in the correct place. 4. 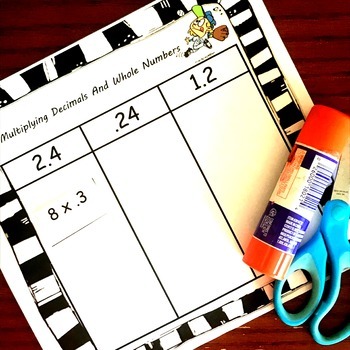 5 Word Problems - Children solve word problems using number lines, arrays, and equations. 5. 3 Written response pages - Children find the mistake, explain why it is wrong, model it correctly, and give two equations to prove they are correct.